First Priority Greater Birmingham’s Northwest Network had the incredible pleasure of partnering with Hydrate Campus Tours on Jan. 17, 2019. Throughout the day, Hydrate Tours visited Minor Middle School and Minor High School. Hydrate exists to inspire students and young adults to live with purpose and integrity so they can become positive influencers to the world around them. Hydrate brings a high energy school assembly with positive messages of hope and encouragement that believing in yourself can spark greatness. No matter the circumstances or difficulties in life, you can rise above the crowd. 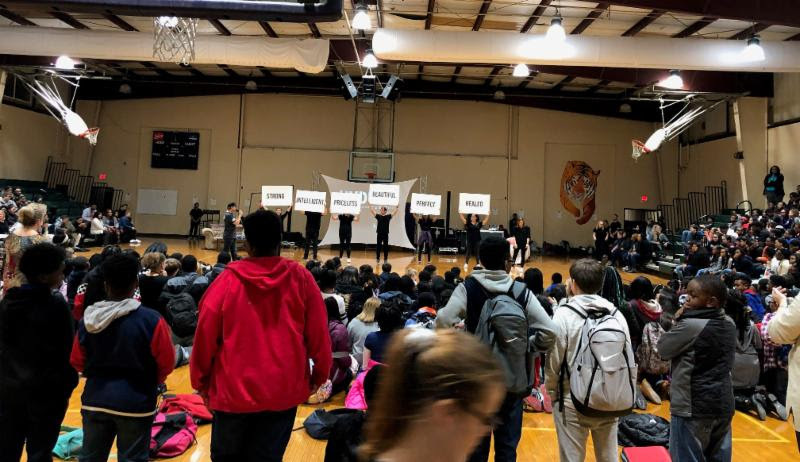 The day included live dramas, musical performances and motivational speakers such as Hydrate Tour Founder and Director Tim Beck, along with Birmingham’s own Short-T. To cap off the day, Hydrate and First Priority were allowed to present a follow-up concert and Gospel presentation on the night of the 17th at Minor High School. Students from the day’s assemblies were invited to come back and pack out the gym. Students, parents, family members and friends from all over the community attended the evening event. At the conclusion of the night, 285 new souls were added to the Kingdom! “What a humbling sight it was to see students and adults leave their seats and gather at the stage making Jesus Lord of their lives,” said First Priority Area Director James Cato. Wow, God is good! Please keep these new believers in your prayers. We are very thankful to Hydrate’s Tim Beck for allowing First Priority to follow-up with those who made professions of faith and help get them plugged into local ministries and campus clubs. We are so grateful we had the awesome opportunity to partner with Hydrate Campus Tours. We hope you will take a moment to check out Hydrate’s Web site and learn more about this incredible ministry!